Although dentistry has expanded over the years to include categories ranging from cosmetics and restoration to periodontal therapy and implant dentistry, at its core dentistry is still about prevention. If dentists can prevent small concerns from becoming big problems, then they can help their patients enjoy greater oral health and overall wellbeing. At Central Dental Associates in Norwood, MA, our dentists practice preventive dentistry to help you and your family have healthy and happy smiles. In addition to brushing and flossing your teeth at least twice each day, we’d like to see you in the office at Central Dental at least twice each year for regular checkups. The objective of these regularly scheduled visits is to allow our dentists and their staff to closely monitor your oral health and more easily recognize any changes that may be of concern. If we do find something concerning, then we’ll want to treat promptly in order to prevent a more complex—and costly—problem from developing. Of course, at these checkups, our dental hygienists will clean your teeth and remove plaque buildup. We’ll also carefully examine your teeth for any signs of decay and we’ll evaluate your gums for indications of gingivitis or periodontitis, the early and late stage of gum disease. When necessary, digital x-rays will be taken to reveal hidden tooth decay or infection below the gum line. To assist you in preventing unwanted cavities, we may recommend fluoride treatments or dental sealants. Fluoride is a mineral that strengthens teeth enamel, the first line of defense against decay. Although fluoride is added to tap water, many people do not consume enough of this mineral because of the popularity of bottled water. A dental sealant is a clear or white plastic coating that is applied to deeply pitted and grooved molars to create a physical barrier between decay-causing bacteria and your teeth. If you or a family member could use an ounce of prevention, then call Central Dental in Norwood, MA, to schedule an appointment for preventive dentistry. We also serve patients from Walpole, Westwood, Medfield, Dedham and the surrounding communities. A smile can speak volumes. However, if you tend to cover your smile because you don’t want people to see the stains on your teeth, then no one can “hear” what your smile has to say. If this is the case with you, then you might want to consider teeth whitening from Central Dental Associates. Our dentists and their team of dental hygienists and assistants have brightened the smiles of many people in and around Norwood, MA, and they can do the same for you. Regardless of why your teeth are stained, with teeth whitening you can likely have a whiter and brighter smile that will actually give you the confidence to smile. If you would rather not take the time for an appointment and you’d prefer to whiten your teeth in the privacy of home, then we can supply you with custom-fitted trays made at Central Dental Associates along with professional grade whitening gel. After whitening for about 30 minutes a day for two weeks, you’ll see amazing smile results. To have a smile that you want the world to see, schedule an appointment for teeth whitening with Central Dental Associates in Norwood, MA. We also serve patients from Walpole, Westwood, Medfield, Dedham and the surrounding communities. The oral-systemic connection is undeniable. What happens in your mouth doesn’t just stay in your mouth—and that’s not even considering the foods and beverages that nourish the rest of your body. The bacteria that lives in your mouth can spread to other organs, causing disease. More often than not, these bacteria gain entrance to the blood stream via your gums, which is why gum health is so important. Central Dental Associates in Norwood, MA, provides periodontal treatment to help you maintain healthy gums for a healthier you. What is Gum or Periodontal Disease? Gum disease is an inflammatory condition of the soft tissue surrounding teeth that occurs when tartar and plaque buildup spread beneath your gum line. This disease has both an early and a late stage condition. The early stage is called gingivitis, as is marked by red or swollen gums that tend to bleed when you brush or floss. Gingivitis is often caused by inadequate oral hygiene, but is reversible with professional periodontal treatment and improved oral hygiene. The dentists and dental hygienists at Central Dental will show you how to properly brush and floss your teeth, so you can avoid gingivitis. The latter stage of gum disease is called periodontitis. This more advanced condition occurs when plaque buildup goes unchecked and the toxins produced by the bacteria in plaque irritate your gums and eventually begin to destroy the tissues and bone that support your teeth. Your gums may even separate from your teeth, forming deep pockets that are susceptible to infection. As the infection progresses, the pockets deepen further and even more gum tissue and bone are destroyed. At Central Dental, we perform scaling and root planing to remove plaque and tartar from your teeth and the periodontal pockets that may have developed in the gums. If your gums are in need of a checkup for signs of periodontal disease, schedule an appointment at Central Dental Associates in Norwood, MA. We also conveniently serve patients in Walpole, Westwood, Medfield, Dedham and the surrounding areas. Is there anything more precious than your little ones’ smiles? Well yes—knowing that those smiles are healthy, too. 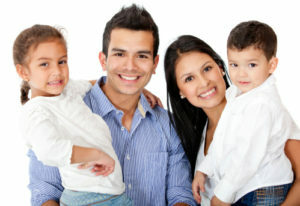 At Central Dental Associates in Norwood, MA, our dentists believe that the foundation of good oral health begins early. Therefore, we place a premium on children’s dentistry in our practice, focusing on teaching you and your child how best to care for their teeth and gums at home and preventing problems before they begin. Actually, children’s dentistry begins even before your child visits the dentist, and it begins with you. As soon as you see that first baby tooth appear, it’s time to begin cleaning. Just take a soft cloth moistened with warm water and wipe baby teeth clean after feeding. As more teeth appear, you can use a small, soft toothbrush dipped in warm water. Begin using a small amount of toothpaste when they are old enough to spit. The dentists at Central Dental Associates would like to begin seeing your children for checkups when they’re about three years old. At their first checkup we’ll examine and count their teeth, assess the health of their gums, and—if they seem ready—we’ll clean their teeth, too. Of course, we hope we don’t find any signs of tooth decay. 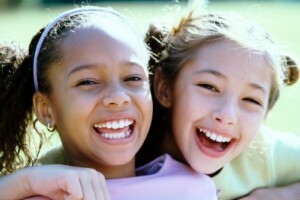 If we do, however, we will repair the cavity with a tooth-colored filling, so your child can have a metal-free smile. As your children grow and mature, there are other preventive treatments we may recommend including fluoride rinses, dental sealants and athletic mouthguards. We want your children to enjoy the benefits of good oral health care, and we look forward to seeing you and them in our office soon! If your children are old enough and need to visit the dentist, then schedule an appointment for them with Central Dental Associates in Norwood, MA. We also see children and adults from Walpole, Westwood, Medfield, Dedham and the surrounding communities.